Although it's comfortable, clear, and hugely immersive tech for music that also impresses in single player games, a few key flaws stop us recommending it as a dedicated gaming headset. Buying a headset specifically for gaming can be a big commitment. They’re often expensive and hard to justify, especially when you can’t remove their microphone or they struggle with your Spotify playlist during the morning commute. Why spend hundreds of dollars on a one-trick pony? That’s where Soundcore Life 2 bursts through the wall like the Kool-Aid Man. 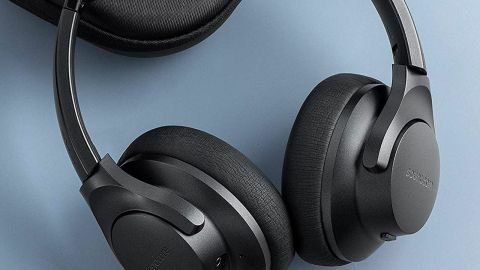 This jack-of-all-trades headset has mastered many of them: excellent audio quality comes packaged with a distinctly premium feel, while noise cancellation features and the ability to get a boost of bass only sweeten the deal. However, such fantastic sound and design don’t stop it falling short of the competition. Make no mistake: the Soundcore Life 2 is a product designed for music first and foremost. As a result, you shouldn’t expect it to match the best gaming headsets. It’s obvious from the get-go that these are very well-made headphones; the Soundcore Life 2 sports a padded headband and soft earpads that are far more comfortable (not to mention handsome) than the $70 price tag would suggest. In fact, that’s a theme for this headset in general - it gives an impression of prestige without the added expense. That quiet air of extravagance is heightened by a classy matte finish, sleek silver logos etched onto its sides, and a hard zip case for travel. It’s an attractive proposition, basically. Look closer and you’ll find that this sense of quality extends to the audio features. Packing surround sound, a ‘BassUp mode’, and noise cancellation, Life 2 helps shut out the world with the efficiency of an overzealous bouncer. While there is an aux cable with built-in mic, you can pair the device with your phone or PC via Bluetooth for a smooth wireless experience. Unfortunately, that same functionality (Bluetooth and the aux cable’s microphone) is not compatible with consoles. And this is where the Life 2 starts to unravel. Don’t get me wrong. As a gaming headset, the Life 2 performs far better than you might expect. Much as they do for music, these headphones deliver crisp audio with good depth and clarity. Most of the time, anyway - although I found the vocal work to be tinny and muffled in Assassin’s Creed: Origins, games like Fallout 76, Destiny 2, and Anthem performed well during our tests. What’s more, the Life 2’s surround sound makes up for any shortcomings. Bullets whip and tear through the air with tangible, startling aggression. Yells and explosions from afar can be pinpointed accurately. You’ll also pick up on a dozen other sounds you’d otherwise miss on standard TV speakers. Add consistently good ambient noise and soundtracks and you’ve got a deeply immersive experience on your hands. That’s particularly true when using the Life 2’s effective noise cancellation mode; a quiet blanket of white noise helps block out everything outside your ears. Thanks to being so comfortable (even for those wearing glasses) you’re subsequently sealed inside a blissful gaming bubble. You’ll be there for a while, too; the headset’s battery life is superb. Life 2 will keep trucking wirelessly for a good 30 hours or so between charges, and I’ve barely had to plug it in over the weeks I’ve been using it. Yes, the bass isn’t best-in-class and you can undoubtedly do better for a similar amount of money, but this is a respectable gaming headset nonetheless. The problem? As mentioned above, any perks you’ve become used to while listening to the likes of iTunes (such as bass boost and Bluetooth functionality) don’t make the transition to console gaming. This is a frustrating step backward, and it’s made worse by my not being able to get the microphone working on PS4. As such, this headset isn’t ideal for competitive gaming. It’s hardly surprising, of course - this presumably wasn’t designed with gaming in mind - but it’s disappointing even so. The Soundcore Life 2 doesn’t seem built for those with smaller heads, either. Despite claiming to fit all sizes, it still felt loose and wobbly on me. A quick jerk of the head forward actually makes it flop off. It’s the cherry atop an unsatisfying stack of issues. The problem with many gaming headsets is that they stumble when used outside of games. The Soundcore Life 2 doesn’t have that issue. It’s a brilliant slice of technology for music and impresses in single player games as well. Comfortable, clear, and hugely immersive, it’s a great choice for the price. Unfortunately, not having access to Bluetooth or its microphone on the likes of PS4 complicates the issue. It’s very much an all-rounder and is a superb choice if you’re only going to use it for games occasionally, but I wouldn’t seek it out solely with gaming in mind.